I find that Magix music maker is easy to learn and use reaper is more complex but reaper can handle REX files or convert them to wave magix can not. there is a 30 day trial of reaper when you download and I think magix has a trial period as well. check out which works best for you! Yes, as stated before, it all depends what you want / need. Many are happy with (the much easier) DS. But for more, you need Carrara. I also like the attitude at Reaper. They want to keep it affordable for everyone. I think their policy is never raising their price. And if you purchase version 4, you get all updates free till the end of version 5. Several times a month you get a message when starting Reaper, letting you know there is an update, with all its details. Yes, there is a 30 day trail, but without any restrictions. You can do whatever you what and also save it. It is fully functional. After watching this tutorial on getting started with Reaper, and it appears to be exactly what I want and need, wrapped into an affordable package. While others that are more expensive may have other features or bells and whistles... I'm pleased with this work flow. I really like Magix, like if I were into rap or loop-combining style music making. But I want and need to compose, record, edit, mix and produce a final output. Will be looking deep into this today or tomorrow. Pre production post work apps (for video) list is complete and anxiously awaiting my command. Ink is drying on the first script's alpha draft. "No... the fog is suppose to rise up from over there." Dartanbeck, I have the feeling you didn't read my previous reply (last one on previous page). You have to be more careful on this. I do not trust the subscribe mail from DAZ too much. I always look at date, time and my last time on this forum. I usually stop posting if nobody wants my answers.
? I'll look - what do you mean? There are several posts with answers from which to chose? On the last post on page 2, I included several links. One of them is a comparison between Reaper and MM. I don't want to push you to Reaper, but you are always very helpful and busy. If you have limited time, you should avoid making the wrong decisions. I "wasted" two years on other animation software, before I found Carrara. Being my birthday week, I'm jumping on to check this forum now and again... leaving a post and being pulled away again. Sorry for my lack in reading everything just now. I promise to check out those links. I will be putting this set of purchases off until I speak with you further. If that works for you? I truly value your help as with everyone else here. I'm now getting pulled again! See, tomorrow is Rosie''s birthday and she is my true reason for living. After fifteen years of marriage, I still look at her with a glistening eye. I worship the ground that she walks on. She is my Treasure, My True Love, My Best Friend, Hero of my Heart - and she also happens to be the Star of my Epic!!! Yes, the most important things in life are not things. I was just looking at the Reaper web site,. mainly because I've never heard of it before.. I actually thought it was "Reason" being talked about, so I skipped some bits. .. my bad. I'm not sure what a "Discounted license" actually means,. and there#s no info on what the restrictions are, but i'm assuming that it's a Non commercial use licence, which doesn't really make much sense to me. So in comparison to Music maker (basic entry level) at 60 euro,.. which is a "Full Commercial licence" and comes with a bundle of sounds which are also copyright cleared and ready to use in your own productions,. comparing the $60 (non commercial) version, or Reaper,. with the "entry level" (full commercial) version of music maker, really isn't a fair comparison. It would be fairer to compare both full commercial versions,. by price , features, and content. Basic entry level software is always designed to be easier and less confusing for the new user,. this encourages use of the product and eventually upgrading to a more complex version. Most software has a Demo / Trial version available,. and that was my first advice,... Go download the trials, play with them, see what you like. then compare features / Ease of use / Support, and pricing. I'm trying to remain un-biased, since I normally use Ableton more than Magix. here's something else to look at. It does not "assemble" or "arrange "sound clips but it can make some awsome sounds. Can input midi so going back to square 1 ( your original post ie looking for something that can make my new midi controller do something besides sit there all silent) this could be fun for you - ITS FREE. Also keep in mind Magix often do deals like daz if you are on the mail list. I took a look at Reaper video too and didn't much like it - but withiout using it that may not be fair comment. So is one euro = $1? I had no idea Reaper was that much. In the vid he mentions that we're watching his vid because we don't want to cough up another &150; for yet another upgrade to what we currently have - so I assumed it was less. 60 euro is .. 51.75 British Pounds,.. or, 78.51 in US dollars.. thanks to www.XE.com it's a useful site for current exchange rates, and quick conversion. Music maker,. (or any other sequencer,. can use Pre-made loops of sampled audio (in audio tracks),. but that's one method, and only concerns Audio. If you're recording your own Midi, or Audio,. then you're obviously composing your own music. So,. don't think that any DAW is "a toy",. that's utter nonsense,. these programs are not toy's. You can compose,. arrange, edit, your own music,. whether that's playing in midi using a keyboard,. or recording a guitar / vocal. using a microphone. 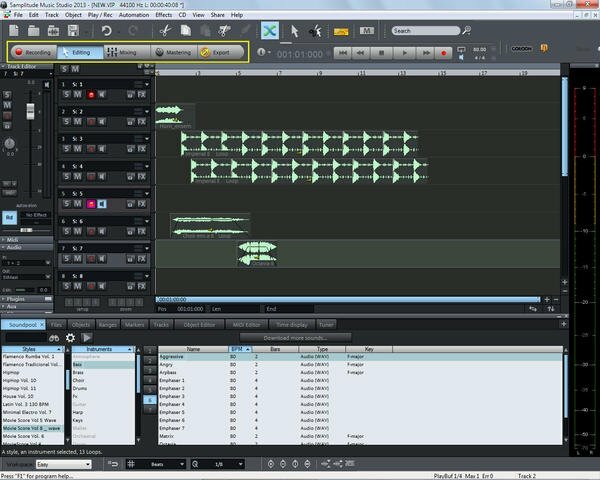 and you can edit the Midi notes, (or even draw notes into the midi editor) or edit the Audio which you've recorded. You can use noise Filters and Gates within the software to remove background noise, and you can also edit the audio to create loop's which can be copied along the track. Download the demo versions,. they're free,. play with them. Yeah, thanks. I'm going to. I want this for home - and yes. I was planning on composing my own music via the midi keyboard. I am actually even enjoying the idea of using the drag and drop method of Music Maker. I'll start with that one as a trial. Do you think Samplitude comes with those drag/drop genres too? most sequencers use several different methods of accessing sounds, whether you prefer to load from a menu list, which is normal for selecting virtual instruments for midi channels,. or drag n drop to load audio blocks from the browser into the time-line. All of these programs allow you to Record, Edit, Mix and Master. the main difference is in how detailed , or simplified the functions are. If you only want to create / compose,. and then let someone else add effects, compression, filters etc.. to what you've done, then you don't need something too expensive with lots of confusing options,.. I even doubt if MM is a DAW. It is easy, you can play a lot, but it doesn't come close to Reaper. If you want to record your own music, you are very limited in MM. For instance, it doesn't have an EQ option. A DAW without EQ? That is a joke. Ask any mixer, recording artist. Ask in any DAW forum what they think of MM and they will confirm what I am saying. The comparison between DS and Carrara is not so bad. With Daz Studio you can insert a lot of content easy and do whatever you want, but Carrara is a different league. You can play with DS and do nice things, but DS is not a real animation program. It is for playing with content (sorry for that DS users). Carrara is animation. DS is playing. A real animator doesn't use DS as its main program. Same for the DAW. You can play with MM, but for the real thing, you need a real DAW. It all depends on what you want / need. Many are very happy with DS or MM, but some want / need more. About the price issue, you are wrong 3Dage. There is only one version. Their approach is, if you like Reaper and are using it professional, they would like it if you buy the professional version. That is it. Reaper is one of the least commercial products I have found. It is cheap compared to others, you get a free update to the next version and their demo is a 30 day version without any restrictions. Reaper is underestimated by many. The ones who are using the big players, like Ableton, are looking a bit down on Reaper. But the ones who are using Reaper, are addicted to it. Most will never leave. It is a bit like Carrara in the animation world. It is underestimated, but once you are more familiar with it, you will stay. I have tried 3DS Max 9 for half a year, but I will never go back. I don't like it at all. This is my last post in this discussion. I have said what I wanted to say. It is getting more a battle who is wrong or right (ego thing?) without really knowing Reaper. according to Wikipedia, even Audacity which I use, is a DAW! not sure what you would call Myriad melody assistant though, my music notation midi based program of choice, it does sampling, editing of wave envelops, effects etc but not VST plugin compatible, the reason I use both it and Audacity. But I must say that after looking at the Samplitude demo video, I believe it is a DAW, which took 10th place in that 15 best that you posted. It's actually fairly robust at that with built in mastering options and effects, EQ, 128 Track recording capability - which I think is pulled off 64 tracks at a time though - but 32 would be more than what I'd need. Definitely not saying anything bad about Reaper, though. My fault, I think. You've missed my point in the question, simply because it's a difficult question for me to 'word'. But I believe that your screenshot answered most of my question on the bottom left of the screen. Genres, which give you a rhythm or beat preset, I believe? Is that right? Anyways, I downloaded the free demo of Premium last night and it's downloading Gigs of sounds and beat as we speak. I have a feeling that Samplitude also has that feature - allowing downloads of their loop collections. I was not intending on using loops at all. But watching the videos helps clarify how much fun it could be mixing and matching,if you can then drag midi notes around and change stuff... kinda cool - we'll see though. Still the full set-up, and I bet you even get that "would you like to download our loops and sounds?" button when it starts. Again. Not at all what I was looking for - but I think I might like that. Just more options to play with. I'm thinking that I could likely use some of those loops and beats and such, and then use IK Philhamonik sounds within? I think it allows that. I am also beginning to believe that what they're doing here, is using the same robust software for driving all of the products. MM is like a core with a certain number of added plugins. Samplitude gets much more plugins added. and on up the line. not positive, but it appears as such. I didn't even look at their $700+ options, but I'm truly wishing that I could - but frankly, I'd be able to take one of those $39 versions and really have fun, while still having a midi DAW at the core, for doing what my original intentions wanted. But for the extra 20, and then for the extra 40 on top of that - it almost doesn't pay to pass that up. Samplitude is currently on Sale (20 year anniversary) for $99, same as MM premium. So now it seems like a big thing figuring out which I'd rather have, 12 GB of assorted sounds, or the extra pile of genres? Well... We don't know yet if Magix is yet the way to go - but it's looking friendly. pjotter has a point about Reaper... many find it to be very robust and perfect as a DAW for a fraction of the price of cu base and such. It is an entirely different competition. That's what I meant by my comment about my singer's studio. He has all of that. Well, I think he uses Sonar - but don't quote me on that. I'll ask him. I don't want to professionally record and produce for people. I want to create music with multitudes of layered symphonic instruments and sounds. That's all. Midi, preferred though. For me, the difference between three quarters and a triplet is too huge to leave be. I'd like the power to edit the notation. The term DAW (digital audio workstation),. is another way of saying, Music sequencer. but it should actually be specific to working with Audio. Dartanbeck is asking primarily abut MIDI,. but most sequencing software handles both. I don't believe I've said anything derogatory about any software here. The only question I've raised was about the difference between the two licences, and their pricing. which I still don't understand. I also felt that the comparing Music maker to a toy,. was completely uncalled for. As for EQ MM has a 10 band EQ , a Parametric EQ, Compressor, and a bunch of standard audio effects such as Reverb, Flange etc.. I'm not trying to be offensive, or biased here, but a discussion about music software, and which product anyone should use (which is personal choice) has absolutely nothing to do with the ego of the person offering the advice,. that's out of order to suggest that I'm on some personal ego trip. A discussion like this shouldn't include anyone putting a product down by suggesting it's lesser than another product, and comparing it to a toy. I'm unsure of what I've said to upset you, but you obviously are. so I personally apologise if I've offended you. that was not my intent. My advice from the start has been to download demo / trial versions of several programs and play with them to help make that "personal choice",. Whether Dartanbeck chooses Cubase, Reason, Ableton, Magix, or Reaper, doesn't concern me. that's his choice. not mine. But, as someone who has never used any of this software, Dartanbeck is asking for advice,. my advice can be ignored, and I won't be phased, or upset by that. I'm also not saying any of these programs are Toys. or in any way are not capable of doing what Dartanbeck wants. I've already mentioned that I use Ableton, and Samplitude, but I also have several other music programs,. Hopefully I'm not biased towards any of them,. as they all have good and bad points. like most software. I wish Dartanbeck good luck with whatever software he chooses. Thanks, because, you're right. I had no clue of what's out there - and my friend who does, is never available - untouchably busy all the time. This has been really value, and I thank you all for your help in this. I really like the idea, especially after watching 007's recommended tutorial video from it's main page. After playing around with it and its limited resources due to being a demo, I am impressed with what can be created with a bit of imagination and song building knowledge. The included 'dummied down' collection of 'objects' to play with was vastly too limited for me to actually do anything close to what I'd like to achieve, using those alone. But the ease of being able to work with those clips was a great experience. Sure I've watched an intro video last night. But I didn't really remember any specifics about mouse use and where to find feature controls. I was happy to find how naturally I could play around with it without having to look up anything like that. I just double-clicked an object which brought up its effects processor. Very cool. I have a decent collection of royalty free music tracks, without even ordering them directly. They all came with software packages that I bought. My collection contains all of my needs for ambient music - for instance the music playing inside the villain's clubhouse, or the tavern down the street, the various places where the people within the movie are listening to their stuff - not the actual movie soundtrack score at all. Edit: This would be my biggest use of such a feature - unless there is a remarkable difference in loop structures that come with the purchased product. So the inclusion of multitudes of loops becomes less of a sought after feature. Whereas Samplitutde's "Free" offering of content is 12 GB of midi sounds. :) Plus for the Samplitude at this rate. My idea of finding a good Digital Audio Workstation, ideal for my intentions, have shaped into the idea of getting my keyboard runs to enter a sequencing device with which I may tweak timing and tune (or pitch), while having the ability to add multiple such sessions as I'm hearing what I've already laid down to tracks. I do remember after watching some of the Samplitude video tutorials at the developer's site (so far a refreshingly rare find for such an app) that Samplitude will allow me to enter it in midi data. The individual bars of midi data can then easily be scaled and moved along the scale in any note or time. In having a play at the controls of MMpremium, I can only assume that this works exactly as easily as the video demonstrated. Even the Music Maker software seemed like it could be a powerful DAW, but the only objects of loops and such are audio, not midi, I believe, so I haven't tried that yet. And the trouble with having such a beautifully robust, full-sized keyboard midi controller, is that I have to make the jup over to my new office before I'll have room to set it up without being in everybody's way, here. So I'm confined to using a mouse at this point. Hence my reluctance to download demos this soon. But I have to make a decision soon, so here we go. I use Cubase and have done since the late 80s. I still use it the same way I did back then..
A glorified tape machine, with superb editing. However I don't subscribe to using software synths. I deliberately record my audio from an analogue sound source, using old fashioned analogue (or hybrid) synths. I play (live), and then edit out the mistakes. The reason? Feel. Play a non perfect line, through a (slightly) noisy signal path and external digital reverb (2x lexicon PCM90s) and keep music alive! p.s. Drum loops are a necessary evil for us non-drummies. I agree Scifi-funk :) playing what you want "live" and editing is the way. Once you've recorded,. Audio, or MIDI,. then you can arrange and edit what you've recorded. The sound you get from a Midi track can be selected from a menu of MIDI instruments. the GM (general midi) soundset is pretty basic but covers most instuments,. However,. you can select a VST instrument, which uses samples of sound or synthesised, or modeled sound. so, don't feel that you're limited to only using the demo content,. you can play and record Midi, and load in Audio from any files you have. Most of the audio loops come in a set of key's,. so, you have duplicate, or complimentary riff's in A, B, C, D, E, F, G.
there's a set of buttons (1 to 7) above the browser,. and you can click to preview, or click n drag and drop to add the different versions. Yeah. I play live all the time, and agree. For this project, however, I could write what I want the strings to play, but never be able to play it on violin and cello and bass, for example. So this is whrere that M-Audio 88 Pro comes in. Plus, my recording studio is nearly 45 minutes away. Unlike creating a 3d animation, I can be dead exhausted from stone work all day, and still play an instrument. My mouse in Carrara simply cannot do that right now - so I have to do my animations when I'm not doing stonework. So that in mind, I need a silent means of working with a full symphonic orchestra in my home. Stone work is nearly always sun up 'till sundown. So I ahven't the time to head to the studio after supper, and weekends I'm off doing gigs on my drums (which expends every bit of energy - but I can do it for an eternity), like I have since I was 14. Only $100 for each of us per night for 33 years now. Doesn't pay the bills, but it does prevent anyone from accusing me of wasting my time in bars! I don't even drink - but everyone else does - so I get to spend my drink allowance on the special of the night. Ahhh, do I love Bourbon Steak night! So you can have, as an example, IK multi Philharmonik open in the background and call upon it from the keystation 88 to record into pretty much any DAW, right? From there I'd be free to add more tracks of more instruments and edit the recording to my heart's content, right? So I'm currently keeping an open mind ATM. Reaper looked great to me for that. MU Tools also looks great - but I need more time with looking into that one. Not all developers have quite the helpful ease into our software tutorials like Magix - which is a real plus towards their very user friendly, yet beautifully robust (in my opinion, so far) range of products. It looks like I'd be able to record and edit in Magix Music Maker just as easily as with Samplitude, but with vastly less mastering capabilities - but still some. And their effects didn't feel cheesy or cheap, either. They really know how to win over the heart - that's for sure. I saw "Sound Forge" amongst pjotter's top 15 list, which I have - but after looking, mine is the nearly free version compared to the Pro version that they're talking about. I do like Sony's interface friendliness, however - so there's a thought for the more expensive lineup - is Sony's Acid Pro. But too much $$$ for me, since these lesser costly options seem like they'll fit my flow just fine. Now it's just the matter of taking everything and trying to absorb as much as I can, to help me make this most important decision. The extras that come with either of the Magix deals really makes them heavy contenders towards click the ol' "Place Order Now" button. But that just doesn't change the fact that I feel a strong need for IK Multimedia's Miroslav Philharmonik. I really want those warm, real sounds and the chorus bits sound perfect for what I need! It looks you are right on this. The info I found was referring to older versions. Garage band makes me almost want to buy a Mac!